Throughout the life of this blog I’ve posted quite a few interviews with various musicians I like. This time I’m in the hot seat. My dear friends Tim Mader-Brown and Lars Stromberg have a songwriting blog called Food For The Beloved, which I’ve linked to before from here. They sent me some interview questions a while back and just posted the results. PS. Tim… found your orange Z avenger. 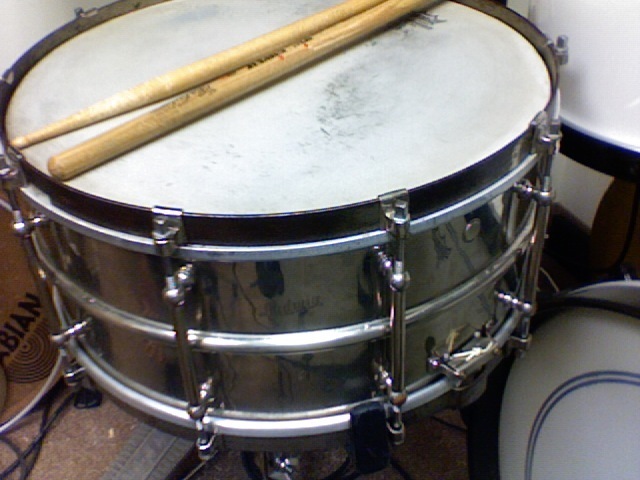 I have suddenly come across an old Ludwig Black Beauty snare drum that I can’t bear to live without. 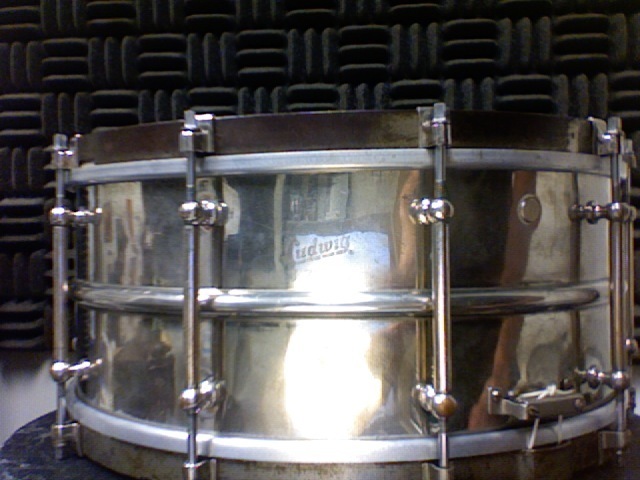 But alas, the Goold’s don’t have any more snare drums in the budget right now, so it’s time for another quick hustling of some gear that I’m not using as often as I should, but that I wouldn’t be selling at all if it weren’t for the surprise option to pick up this Ludwig snare. That’s my way of saying that I stand behind this stuff… it’s all in great shape and worth grabbing if you need something like this. PS. I’m also selling a pretty nice beginner-level Mapex kit on behalf of one of my students, and then when I was scrolling down other CL posts just now I found this killer acrylic 3-pc Risen Drums kit priced pretty fairly (especially for the huge sizes). UPDATE: All of the above stuff is now spoken for, except for the Anvil case. I have a handful of other ATA road cases and I’m getting tired of them sitting around. All of them were “project” purchases and now they’re just collecting dust, so I’ll be selling them super cheap. I’ll post a CL link soon. I am fiercely bummed out and disappointed in myself for having not been at the Anoushka Shankar performance a couple days ago at The Dakota. Anoushka is the daughter of Indian classical music’s most revered figure, the internationally-acclaimed Ravi Shankar. Anoushka and Ravi both play sitar, the primary instrument in Indian classical music, a form of music I really love. 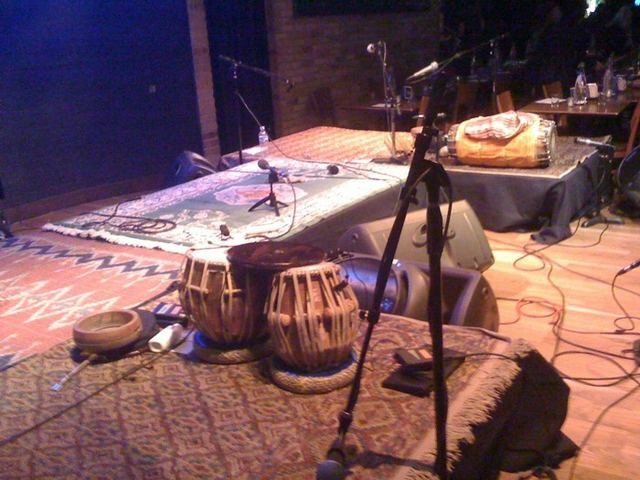 Besides the sitar, traditional Indian classical performances typically include percussion instruments known as tabla drums, pictured above (photo by Todd Anderson at Tuesday’s Dakota performance). I enjoy all the elements of Indian classical music, but I was initially drawn to it because of the incredibly complex nature of playing tabla drums. I informally studied the instrument for a few months a while back, and let me tell you, tablas are VERY DIFFICULT to play well. Read the whole thing (and the broken link is now fixed). I’m neck-deep in a solo project right now. It’s finally happening. I’ve been thinking about this / mapping it out / strategizing the whole thing for years now, and for a few random reasons it’s all coming together these past few weeks. I’ll post a little more about it when it materializes a little more. Think DJ remixes. 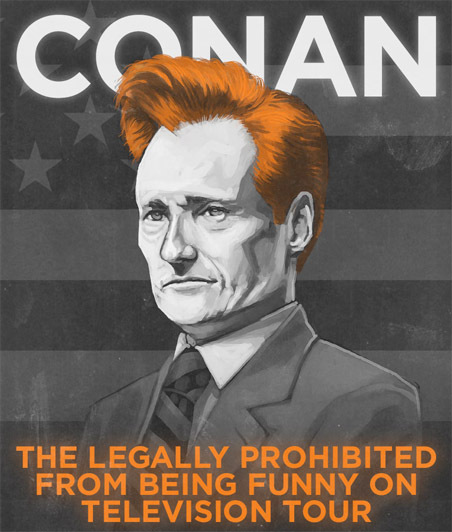 Former Late Night host Conan O’Brien is currently on a music/comedy tour with the Max Weinberg Seven (now known as the Legally Prohibited Band). Conan and his band are playing theaters across the country for the next couple months, and some soundcheck footage has serviced. Check out Conan’s pretty awesome British accent as the band covers a Radiohead tune. Lots of gigs is a good problem to have, and frankly, I wish it was a problem I had more often. When I play a gig with Jeremy Sanoski or Elizabeth Hunnicutt, I’m playing music that I’ve played many times before. We often don’t have a rehearsal before hand, and there’s no reason for me to have charts or notes or anything. I have all the songs for those artists totally memorized and internalized. But then there are the gigs where I’m playing with a band that I’ve never played with before, or playing at a church or special event where the music is unfamiliar and new. That kind of gig is what I call an “uploading” situation – a performance that I have to basically cram for. I have to “upload” the songs and parts for the gig into my brain before I can play well, because I don’t have anything memorized or internalized. All four of my gigs last weekend were uploading gigs. I spent Friday afternoon prepping for the Good Friday service at my church, with a short rehearsal before hand and then the service that evening. Then Friday night and Saturday morning I prepped for my Saturday evening gig with Vicky Emerson (I play with her once a year, so her stuff is by no means memorized). When I got home on Saturday night I spent a few hours preping for Sunday morning’s Easter services at my church, followed by a short rehearsal Sunday morning. I then went directly to a rehearsal Sunday afternoon for an Easter service gig with Joel Hanson that evening. So over a period of about 48 hours I uploaded 4 completely different sets of music… and my brain was definitely a little tired on Sunday night. My gig prep almost always includes me sitting at my kitchen table at home and running the songs from top to bottom in my head and just imagining myself playing them. Like how my grandpa used to tell me to “visualize yourself making this” when I was about to go for a putt. I seriously just sit there in silence and run the whole set, which helps me to familiarize myself with not only the songs but also the transitions. Sometimes I even do this in the car on the way to the gig. I always use my computer as a “cheat sheet” when I’m doing an uploading gig. I try to get as familiar with the tunes as possible ahead of time by listening and what not, but then I write all my thoughts down and condense them. Song form, bpm, who starts and how it ends, etc… I write it all down in a Word document and have my laptop open next to me at the gig. Even if no one else in the band has in-ear monitoring, I use my in-ears and plug them directly into a click track for each tune. I will often turn the click off once the song gets going, but at least I have the official tempo for each tune when I count off the songs. I don’t want this to be misunderstood: I don’t mean that you shouldn’t give yourself adequate time for adequate preparation. What I mean is that I don’t do prep for a Saturday night gig on Tuesday. This is partially so that I don’t forget over the days between prep time and gig, but mostly because I probably have different gigs on Thursday and Friday and I don’t want to cross the wires on the gigs. So, for example, I intentionally waited to do my Easter morning gig prep until after Saturday evening’s gig, even though I got home late on Saturday night. As soon as I got in the car after the gig I began listening to the music for the next morning, and spent time “visualizing” the set once I got home. It’s definitely “last minute,” but it leaves the set freshly uploaded with nothing else getting in the way. Finally, let me say that uploading gigs are a ton of work but REALLY worth it. A cool quote I read from a noteworthy author the other day: “The brain is not a shoebox that “gets full,” but is rather a muscle that expands its capacity with increased use. The more you know the more you can know.” While multiple uploads over one weekend might make my brain tired, it will ultimately stretch my mind so that the next time a weekend like this comes along I’ll have a little more of the mental stamina needed to handle it well. I’ve been using Evans Coated G2 heads lately on my toms and most snares. I have a few snares that feel best with other heads, but the Evans have been dominating the scene for sure. In a nice and unexpected reciprocation, Evans posted the glow kit video on their Facebook page and Twitter page!